The shortest day of the year – grey, damp and forgettable. Digby the dog and I are standing, looking out across the lake. It’s shaped like a kidney bean, half a mile or so round, and fringed with trees and bushes, with a stretch of rough woodland along one side. And it is entirely artificial, created as an open space when all the surrounding houses were built in the seventies and eighties. Except today the lake has gone. Usually you can look out and see the geese and the magpies and the line of trees across the far end. But this morning there is nothing – just a blanket of soft mist covering the water. We set off on our usual circuit, the world on our left and the gently shifting emptiness on our right. The mist is moving, coiling, reaching out towards the bank, then curling away, like water starting to boil. For a moment it draws back and I see a fleet of Canada geese, silent, still, like a fleet of Nelsonian men o’war at anchor. 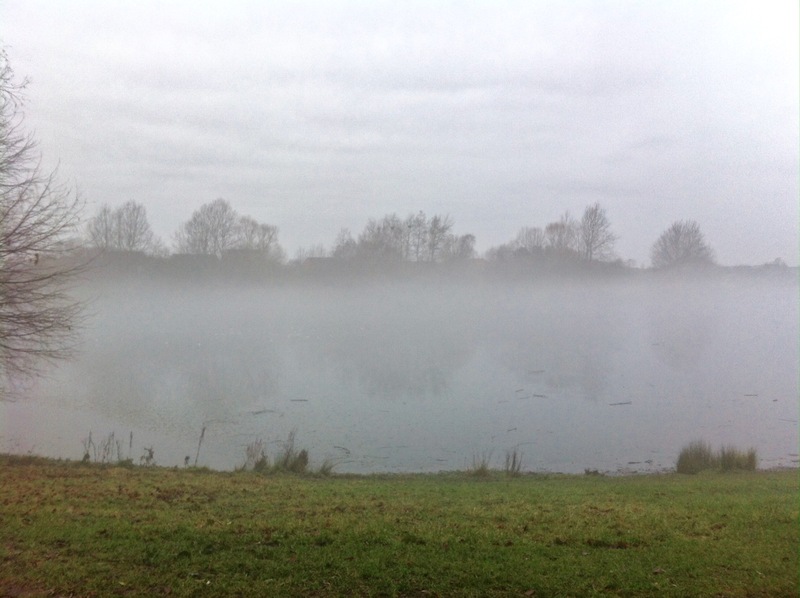 The mist is gathering together – a muffled drumbeat getting louder and faster as I listen. A swan bursts. out of the mist, white wings wiffling through the air, webs plashing the water, lifting into the swirling mist and out of sight. Thanks. and Christmas wishes to all those who have followed me over the last year.